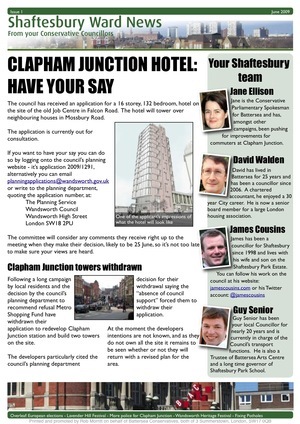 The Shaftesbury Ward councillors are now producing a regular newsletter of news affecting the ward. You can download the latest copy. The first issue is available now and you can download it by simply clicking on the image to the left. We intend to produce the newsletter on a semi-regular basis – every one or two months – depending on news. Obviously you can download from here or from the Wandsworth Conservatives site if you wish, but if you’d prefer to have it sent directly to you the just drop me a line at cllr@jamescousins.com. I will not spam you and will only use your address for sending out our newsletter or news updates, I would not anticipate more than 1 or 2 emails per month.